An inspiring, real world guide for artists, in the classic bestselling tradition of What Color Is Your Parachute?, that shows how to build a successful, stable career in the performing arts, from the President and CEO of The Music Center in Los Angeles, who has carved her own success through her creative talent and business skill. While performing artists have many educational opportunities to perfect their craft, they are often on their own when it comes to learning the business skills necessary to launch their careers. At the end of the day, show business is, well, a business. In The Artist’s Compass, Rachel Moore (who rose from a dancer in the American Ballet Theater’s corps de ballet to become the CEO of that organization—and is today the head of The Music Center in LA) shares how to make life as a performer more successful, secure, and sustainable by approaching a career in the arts like an entrepreneur. Misty Copeland calls Moore “a great example of a woman who used the skills that we gain as dancers to become a leader,” and it’s those hard-won lessons she imparts to a new generation of artists in this book—encouraging every performer to develop marketable skills alongside their creative talent. 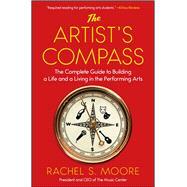 With testimonials from artists like Lang Lang, Sigourney Weaver, and Renee Fleming, plus inspiring anecdotes from Moore’s own journey in the arts, The Artist’s Compass teaches aspiring performers how to take charge of their own careers and how to create their own brand and marketing platform to achieve personal and professional success. In an engaging, “realistic, but also passionate” (Publishers Weekly) voice, Moore combines her artistic and corporate experience to address the finer points of building a career in a challenging industry. The Artist's Compass is the essential success guide for aspiring artists, driving home the point that honing professional skills beyond the stage is not forsaking one’s art, but for the sake of one’s art.